In some form or other, cars have existed since the nineteenth century. Their introduction changed civilization, giving fast personal transport to large sections of the population while creating a new workforce and introducing a new aspect of popular culture. The automotive industry now exists everywhere. Although the U.S. dominated automotive production in the early 20th century, cars today are produced on a huge scale worldwide, with China currently the world’s leading manufacturer of road vehicles. Across the world, 81.5 million cars will be sold in 2018 alone. In the century and a half since the first cars, automotive manufacturing processes have changed significantly. When the mass production of cars began, around when Ford introduced the iconic Model T, most assembly work was done by hand. Since the 1960s, however, robots have become commonplace, carrying out welding and assembly in a much shorter timeframe than would be possible with human hands only. For certain auto components, the process of CNC machining, which involves carrying out tasks like drilling and boring with computer control and automation, now serves as a favorable option for both prototyping and production. CNC machines turn a digital file into a sequence computer instructions, which are sent to a motorized tool such as a drill, lathe or mill. The tool turns a block of material into a finished product by cutting it in the appropriate places, and can provide much greater accuracy than conventional machining. CNC machining can be used to create several important components of a car’s combustion engine. For example, a large aluminum block can be machined into an engine block (or cylinder block), the metal structure that comprises an engine’s cylinders where moving pistons travel up and down. Although programming the CNC machine is a time-consuming process that requires a high level of skill, the machine can, once prepared, carry out its instructions without assistance. This means multiple engine blocks can be machined in succession without a significant increase in labor. Cylinder heads, parts that enclose the cylinders above the cylinder block, are also commonly produced using CNC machining techniques. The machining of aluminum is one of the most important applications of CNC technology in the automotive industry, but materials such as acrylic glass or Poly(methyl methacrylate) (PMMA) can be used to make other important components. 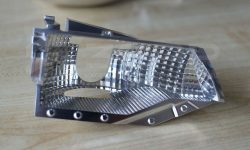 By machining PMMA, manufacturers can produce lighting for a vehicle, including both its headlights and interior lighting. 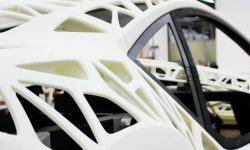 Although these acrylic pieces need grinding and polishing after the CNC machining, the entire process is still relatively fast, allowing automakers to prototype new light fixtures for their cars. PMMA is commonly used as a shatter-resistant alternative to glass, and can be made into windows, transparent shields, fish tanks and other objects. CNC machining can be used to produce a slew of other car parts, including but not limited to suspension components, exhaust parts, carburetor housings, fluid system components, bushings and valve retainers. The manufacturing technology is also particularly useful for customization of vehicles and their components, since CAD allows for the quick alteration of part designs. One of the most significant advantages of CNC machining car parts over conventionally machining them is speed. Since the machining is carried out automatically by a computer, no human limitations such as fatigue need to be factored into the process. The speed advantages of CNC become particularly apparent when producing large volumes of a part, since the computer instructions can be repeated as many times as necessary. Conventional machining may, however, be faster in certain instances, such as when only a single unit of the object needs to be produced. In these cases, the time it takes to create the computer instructions may exceed the time it would take to machine a single part manually. Another reason why automotive manufacturers favor CNC machining is the accuracy of the process. The digital and autonomous nature of the process leaves little possibility of error, while the finest machining settings provide tolerances of ±0.001″. Understandably, the automotive industry demands such fine tolerances, since the malfunction of an engine or other critical component could have severe consequences for the end user. Since the same CNC machining job can be repeated multiple times without discrepancy between parts, the technology is particularly useful when a manufacturer needs to produce large volumes of a single component. And in an industry where 81.5 million cars are made and sold per year, a demand for large volumes is commonplace. Fortunately, CNC machining is more cost-effective when dealing in larger volumes, since the actual machining of the product is less labor-intensive than the preparatory stage, which involves digitally designing the component, preparing G-code and selecting materials. As one of China’s most trusted prototyping specialist’s, 3ERP is capable of realizing even the most complex of automotive CNC projects. 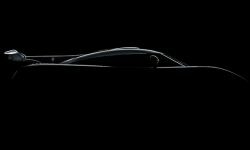 The company has previously worked with auto giants like BMW, Bentley Motors, Lamborghini and Land Rover, and can produce high-quality components using its precision 3-, 4- and 5-axis CNC machining centers. Get in touch to see how 3ERP can get your project on the road.